Data structures hold information in a way that makes it easier to be manipulated by software, given particular constraints on computing resources such as the time or space taken up. A linked list takes very little space in a computer’s memory on top of the space taken up by the data it contains and is very quick to add new data to but it is very slow to search from the beginning to the end of the list. In contrast, a “hash table” data structure makes looking up information much faster by calculating a unique identifier “hash” for each item that can be used as an index entry for the data rather than having to search all the way through a long list of links. Think of a hash as a very large, very unique number that can be reliably calculated for any piece of data – any file containing the text “Hello world!” will have the same cryptographic hash as any other. The cost of this fast access is that the table must be allocated and configured in full before data can start to be stored in it. A “binary tree” balances speed and storage space by storing data in a structure that looks like a tree with two branches at the end of each branch, creating a simple hierarchy that takes very little initial extra storage space but that given its structure is relatively fast to search compared to a linked list. Each block in a blockchain is linked to the previous one by identifying it using its (cryptographic) hash value. 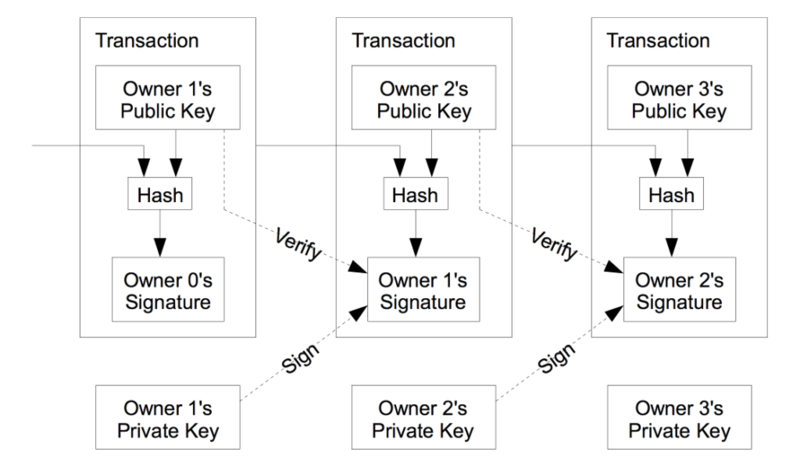 And the transactions in the block are stored in a (cryptographic hash) tree. This means that a blockchain is a more complex structure than the simple image at the top of this page. But so what? Why should we care about the shape of the blockchain when its social, environmental and political impact seem to be in such urgent need of critique? The geometric, techonomic and social form of a blockchain are all related, and understanding one helps us to reason better about the others. As the quick tour through software data structure design above indicates, the constraints on technological form are not abstract, they are tied to real needs and agendas. Bitcoin is no exception to this – the lists and trees that make up its blockchain as they are built and broadcast on a peer-to-peer network by computers competing to claim economic incentives for doing so were chosen very explicitly to exclude the intervention of the state and other “trusted third parties” (such as banks) in authentic economic relationships between peers. Bitcoin’s algorithms prioritise the security of the blockchain above all else, maximising security like a mythical Artificial Intelligence “paperclipper” maximises the production of a particular material good regardless of the other consequences . This explains Bitcoin’s energy consumption, which whilst lower than the US military or the other equivalent systems that guarantee the security of the dollar is probably still much higher than Satoshi Nakamoto originally envisioned. There are other algorithms, though, which have been created since 2008 to address perceived flaws in Bitcoin’s design or to address different ideological agendas. 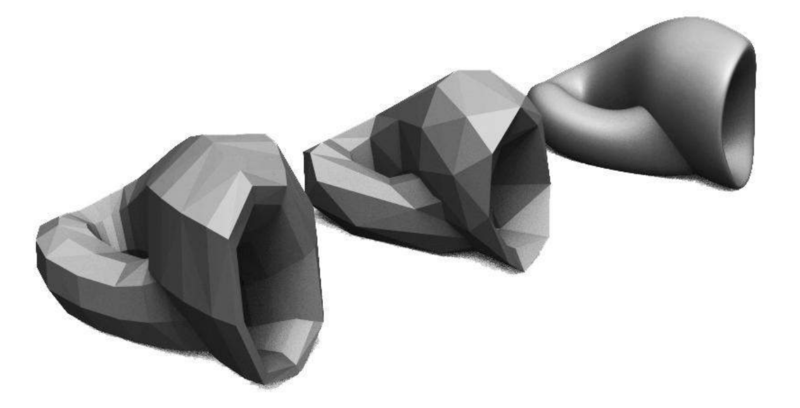 These create different forms, and contrast instructively with that of Bitcoin’s blockchain. Please note that these are experimental and often controversial technologies. Nothing that follows is investment advice. Bitcoin creates blocks on average every ten minutes. Faster currencies quickly emerged, LiteCoin and Dogecoin are leading examples, with 2.5 minute and one minute block times respectively. Blocks may contain more or fewer transactions, and be more or less frequent even within the same blockchain as the algorithms tweak its parameters to ensure its security. Blockchains have rhythm, they stall or race, each block is larger or smaller and closer or further from the last one. Transactions fan into and out from addresses in each block, with varying values of currency or amounts of data each time. We are now very far from the block-and-arrow diagrams of linked lists indeed. The Ethereum system, which extends Bitcoin’s financial ledger into a more general system for “smart contracts”, has the smallest block time of any leading cryptocurrency – fifteen seconds. Like the others mentioned it still uses a variant of the energy-hungry “Proof of Work” security system from Bitcoin. In Proof of Work, anyone who wants to add a block of transactions to the list must consume computing resources to solve a puzzle (essentially guessing a large number ending with multiple zeroes). As these resources cost money, anyone willing to expend them must stand to gain more from adding the next block than they lose to their electricity bill. This Game Theory gambit secures a Proof of Work blockchain. The mindlessly focussed, paperclipper nature of blockchain security algorithms means that as more people use more computers to compete to be the next person to add a block to the chain and claim the economic reward for doing so, the difficulty and therefore the amount of electricity required to solve that puzzle has increased massively, growing the energy footprint of cryptocurrency. Ethereum is planning to switch to a “Proof of Stake” system, like that used in currencies like NXT and Decred (about which more below). Rather than burning electricity like Proof of Work, Proof of Stake uses a blockchain’s own existing currency “staked” by users to demonstrate their standing within the system and to thereby get a chance to be chosen by the network to add the next block. Proof of Stake and its related “Proof of Authority” system move from the “miners” of Proof of Work who operate on the blockchain from outside to a system of capitalist investors or even an aristocratic class of gatekeepers who operate within the logic of the blockchain itself. This folds the blockchain’s outside in on itself. Bitcoin’s blocks have been fixed at one megabyte in size since a temporary security fix by Satoshi Nakamoto introduced the limit. As Bitcoin usage has grown, blocks have become increasingly full (allegedly often as a result of economic “spam” attacks intended to manipulate prices – competing for space in blocks drives up transaction fees which can in turn discourage users and ultimately drive down the price of Bitcoin). How should this problem be addressed – how should Bitcoin scale? Should the number of transactions stored in the blockchain grow, increasing the block size limit and making it harder for individuals to store the blockchain on consumer hardware in a decentralised manner? Or should transactions be somehow moved “off-chain” into “second-tier” systems that build on top of the blockchain, adding complexity and introducing potential new choke-points for existing capital to exploit? Big blocks or small blocks (like the big or little ends of eggs, or integers…)? This is a real debate in the Bitcoin world, and illustrates how the consequences of a simple change in technical form like, for example, increasing block sizes from one to two megabytes, can have profound effects on the social and economic form of a cryptocurrency. “Big blockers” propose solutions like the breakaway “Segwit2X” or “Bitcoin Cash” systems, scaling “on-chain” with ever greater amounts of data in the same structures. 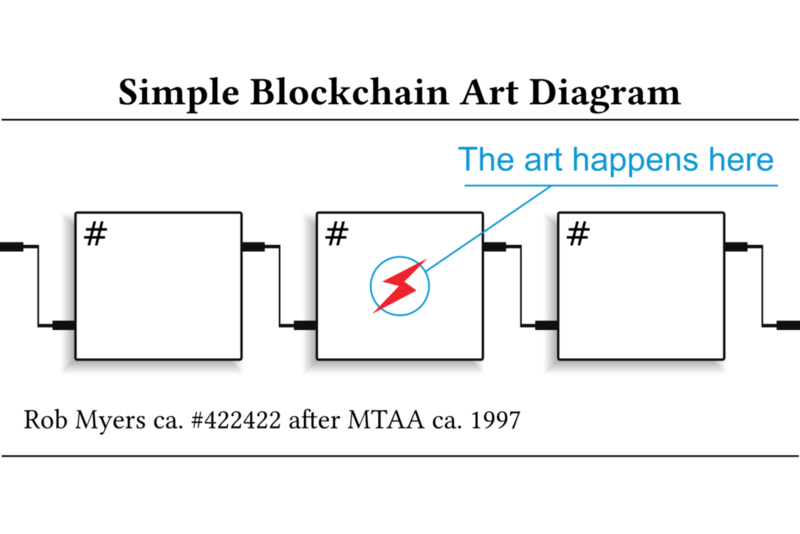 “Small blockers” propose solutions that move data out of the blockchain, into “Segregated Witnesses” that store cryptographic signatures outside of the blockchain, or the cybernetic rhizomes of “Lightning Networks”. A Lightning Network adds a second peer-to-peer network of nodes that pass transactions between themselves. These are all valid Bitcoin transaction data structures, but unlike the main Bitcoin peer-to-peer network they are not immediately broadcast to the main Bitcoin network to be bundled up into blocks. Rather they can be replaced at any moment by new transactions, sending different amounts of cryptocurrency along a “channel” between one or (most often) more participants arranged in a random network like the one used by the Tor privacy network. It’s an elegant but sometimes complex solution, and one that triggers moral panic within some elements of the Bitcoin community equivalent to that triggered by Bitcoin within some elements outside of it. Lightning Nodes with more Bitcoin can extract more fees from Lightning Network transactions, to be sure, and this is a form of centralisation. Decentralisation’s value to cryptocurrency is as a concrete guarantor of security, and Bitcoin’s value is its security. But individuals can still run Lightning Network nodes and send transactions between each other, and pools of capital already have centralising effects in exchanges and mining cartels. Techniques similar to those used to move transactions off-chain by Lightning Networks can be used to move value between different blockchains without exchanges centralising the process. “Atomic Swaps”, the “Plasma” system and the realisation of the previously mythical “Doge-Ethereum bridge” using the TrueBit system are all different ways of building wormholes between the separate universes of individual blockchains. 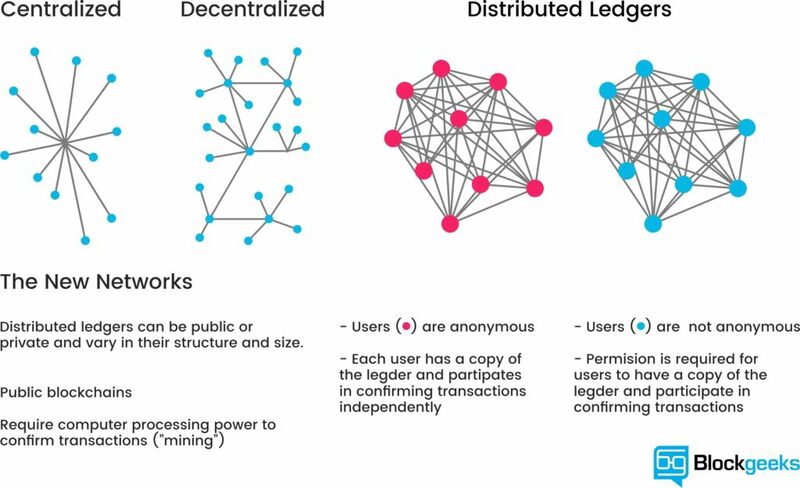 Another approach to scaling is borrowed from conventional database design: breaking the blockchain into smaller and smaller pieces or “shards“, forming another tree structure, allows each group of users of the blockchain to only have to keep track of the part that contains the transactions they are interested in. The Ethereum blockchain will move to sharding in future, after its switch to Proof of Stake. Sharding destroys the metronomic, panopticonic unity of the blockchain to create islands of transactions whose truth is local to them, a non-monotonic logic that makes moving value and information between shards difficult but still not impossible. CryptoKitties can go on their own shard, the Gnosis prediction market on another one, and if one needs to bet on something kitty-related this will require communicating cross-shard. From islands in the net to islands in the blockchain. Techonomically, the data structures and economic incentives of such a system are more complex than a unified blockchain, but making access to the network cheaper by requiring each user to store less data to send their transactions restores the blockchain’s initial low barrier of entry. Deciding how to scale is a matter of governance. The Decred cryptocurrency has put governance front and centre. As well as moving to a hybrid Proof of Work / Proof of Stake system it has implemented an “on-chain-governance” system. Decred contains the forum for its own critique and transformation, implemented as an extension of the staking and voting system used by its Proof of Stake system. On-chain governance is controversial but addresses calls to improve the governance of cryptocurrency projects without falling prey to the off-chain voluntarism that can result from a failure to understand how the technomic and social forms of cryptocurrencies relate in finely-tuned balance. Some post-Bitcoin systems move further away from the form of a chain or do without them altogether. The Holochain system gives each user their own personal blockchain and stores a link to it in a global “Distributed Hash Table” of entries (like that used by the BitTorrent system), a forest of trees rather than a tree of shards. This possibly solves the bandwidth problem of simple blockchain technology but weakens some of their strengths in a trade off of convenience against long-term security and robustness. Iota (the most controversial technical design discussed here) doesn’t have a blockchain at all. It uses a “tangle” of transactions, within which each new transaction must do the Proof of Work of validating several previous transactions. This seems like an ideal restoration of the original vision of Bitcoin as a peer-to-peer currency, solving the problems centralisation and energy usage, but the current Iota network is in fact heavily centralised by its reliance on nodes controlled by the Iota foundation to secure it. IPFS is not a cryptocurrency and does not use a blockchain but it complements the blockchain technologically and often socially. IPFS is related to blockchain technology in its use of cryptography and the logic of game theory but also as a popular way of storing information that is too large to fit on the blockchain. And in its use of a cryptocurrency token – “Filecoin” – to pay for storage on its main network. Filecoin was released in an “Initial Coin Offering” in 2017, and that is all we will say about ICOs here… IPFS uses a “Merkle DAG”, a network of links similar to the World Wide Web or a filesystem, but with each item (the pages or files) represented not by a human-given name but by the cryptographic hash of its content. “Merkle” refers not to the German Chancellor but to the computer scientist who described this use of cryptographic hashes in a tree data structure (like that used in Bitcoin). “DAG” is an acronym for “Directed Acyclic Graph” – a network with no loops in it because loops would confuse the algorithm. IPFS distributes content using a “market” algorithm, bartering for blocks of data on the network with Filecoin or with other blocks. Each of these pocket universes of social and economic reality has its own structure and forms, its own space and geometry. Chains, and being on or off of them. Blocks of different sizes and fullness, with varying distances between them. Channels, rhizomes, shards, tangles, mines and thrones. Forests, tables, graphs, markets and identities. These formal differences distinguish different cryptocurrencies technologically and politically. Algorithmic differences are ideological differences, this is not an external critique it is internal to the logic of cryptocurrency – algorithms are changed to better instantiate what is just. These algorithmic differences produce formal differences. Their surplus value and unintended consequences continue this process of critique-in-code. The question of the shape of the blockchain opens up onto a space of technomic, geometric and social forms. We can move through the hyperspace containing and relating these forms to the specific spaces of individual blockchains that are built around them, through the constraints and agendas that they reflect, out into wider society. The gaps and overlaps in this space indicate useful problems for the work of development or critique. Given this, geometries and forms are at least as useful a navigational marker as professed intentions or revealed preferences. But only if we can imagine and visualise them. Art deals in form, from the spatial volumes of Renaissance perspective to the choreography and logistics of Relational and Contemporary art. Whether promoting, like Jessica Angel’s public art envisioning of the Doge-Ethereum bridge as a Klein Bottle, critiquing or simply rendering perceptible the very different kinds of form that make up the geometric, technomic and social forms of the blockchain and the relationships between them, art has the unique potential to uncover the true shape of the blockchain.